Why Might Your Senior Consider Changing Her Living Situation? Your senior might be wondering if it’s time to change her living situation or you might be the one suggesting the change. Regardless of who brings up the topic, these are some of the reasons such a change might be a good idea for her. Home Health Care Roswell GA – Why Might Your Senior Consider Changing Her Living Situation? Home maintenance, even if your elderly family member is renting her home, can be a lot to keep up with on a regular basis. Moving to a smaller home or to one that is easier to maintain makes a big difference. It can also help your elderly family member to be safer at home. As your senior ages and her health changes, she might need some different medical procedures both at her doctor’s office and at home. Testing blood sugar and blood pressure might not be so complicated for her at first, but as she adds other procedures, like maybe using a nebulizer, she might feel more comfortable with more help. If your elderly family member already experiences a little bit of trouble with her mobility, that can worsen quickly. Her current home might complicate her existing mobility issues, especially if her home has stairs or narrow doorways. A home that helps to accommodate her mobility issues rather than compounding them allows her to have greater freedom of movement. 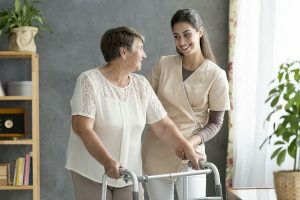 Worsening health and problems with mobility can also make it difficult for your elderly family member to take care of personal care. Personal care tasks are activities such as bathing, grooming, and getting dressed. If she’s having trouble with these activities and not letting you know, you might start to see changes in her overall hygiene. When your senior’s brain starts to change, how she approaches lots of normal daily tasks can also change. She may have a tough time making decisions and handling tasks that gave her no issues before the changes started. She might also have a problem remembering what she needs to do. All of this can mean that a change in residence is a good idea. Having help from you and from home health care providers can help to make the transition easier and can also help with these issues. Home health care providers have the experience to help your elderly family member to cope with these changes as they crop up for her. If you or an aging loved-one are considering Home Health Care Services in Roswell GA, please contact the caring staff. Email: info@realmccoyhc.com • Phone 404-536-1060. The Real McCoy Home Care is your locally owned and managed in-home, non-medical home care agency. Serving North Metro Atlanta.